Join thousands of other marketers, business owners, and future thought leaders subscribed to our newsletter. If you want to get your products in front of your target audience on Google, then you have to do more than write SEO-friendly blog posts (although that is important). That’s where Google Shopping comes in handy. Google Shopping is officially known as Google for Retail and is the advertising campaign arm of the search engine behemoth’s operations. 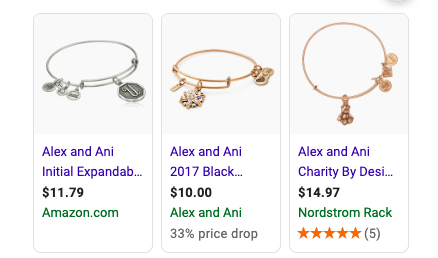 With Google Shopping, users can compare and shop for products. Furthermore, it works wonders for your business. That's because Shopping ads drive 75 percent of ad clicks of searches for non-branded products and 52 percent of clicks from an ad for both branded and non-branded product queries. Therefore, if you're not using Google Shopping, then you're missing potential sales. 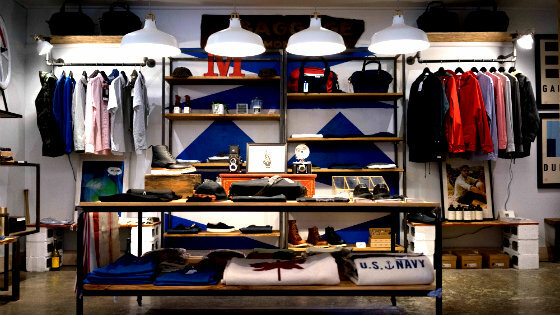 The first step to support Google Shopping starts with setting up your merchant account via Google's Merchant Center. With Google's Merchant Center, you can upload your product information, store, and brand to advertise your products. Getting started with Google Merchant Center requires having a Google account and signing into the Merchant Center, selecting a location, and configuring your account. You'll also need to agree to Google's Terms of Service. Lastly, you'll need to verify and claim your website URL to confirm you own the website and can make changes to the content. You can then upload the product information. Google Shopping works by linking your Google Merchant account and your Google Ads account. That means you'll need to sign into your Google Ads account and create a Shopping campaign. You will then be able to develop campaigns like these merchants did. All you need to do is select the Shopping link under the Campaigns tab and adjust the settings to include a name for your Shopping campaign. This will generate a merchant identifier, which will sync with your Google Merchant account. You can also select the country where you want the products sold and geographical locations where you want people to view your ads. Start selling products by creating an ad campaign. Create your ad group, give it a name, and add your products. You can then alter and create groups and generate a product feed with different identifiers, such as the brand, price, availability, and description of your product. 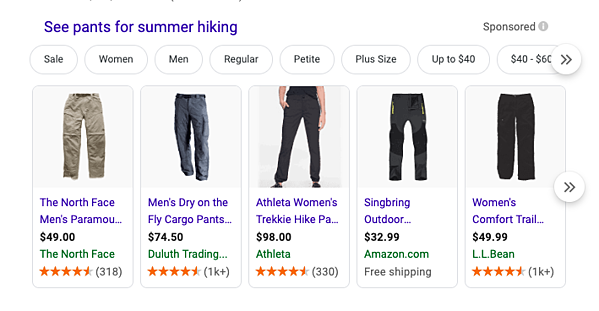 Take these suppliers of "pants for summer hiking" for example. Make your product data and pricing clear. Give shoppers the correct expectations with transparent prices and product information. For instance, use single product images for single products instead of bundles. Also, identify pricing per product so shoppers aren't confused. Segment your campaigns. Niche products often have the ability to drive higher conversion rates than if you bundle all of your products in one Google Shopping feed. Without segmenting your products, a popular search term can take up the majority of your daily budget. Instead, consider segmenting your products by different categories, such as price and seasonality. Think about UX. Make it easy for shoppers to navigate through your landing page so they find your products easily. Leverage retargeting. Remind shoppers about your products by creating a display retargeting campaign and using features, such as retargeting lists for search ads (RLSA). This helps to increase the chances of conversion. Optimize your product descriptions. Make it easy for shoppers to find the brands you sell by using popular keywords for the brands you offer. Also, make the description unique to stand out from your competitors. 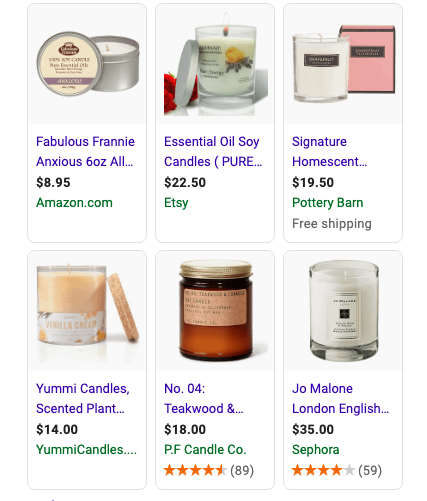 Take these "soy candles with essential oils" for example. From attracting new buyers, to giving existing customers new ways to shop across different Google platforms, Google Shopping offers a whole host of benefits. If you want to use the service, it's important to use best practices. By following this guide and implementing best practices, you can get up and running with Google Shopping in no time! What's your unique selling proposition? Not sure? This FREE toolkit will help you narrow in on an effective USP (unique selling proposition) for your company. Close more deals with your well-crafted USP! Emily creates content at CWS. She works to generate an influential and relevant voice for clients in their industries. She hopes to create a bridge between valuable content and goals met. What is Two-Factor Authentication and Why do I Need it? ©2019 - Corporate Web Services, Inc.